After Burger King tweeted that it was all out of “hamerders” in response to Donald Trump’s misspelling of the word “hamburgers,” social media responded with modified logos for the fast food chain. One logo, posted by a user identified as Jim Hall, whose biography describes him as an “artist,” was particularly good. Hall’s design closely matched the custom typography that Burger King’s logo uses. In fairness, the only character that needed to be created was the “D” — the “R”s and “E”s were likely borrowed from other parts of the logo design. It’s not clear if Hall created the design himself or was reposting it from someone else. 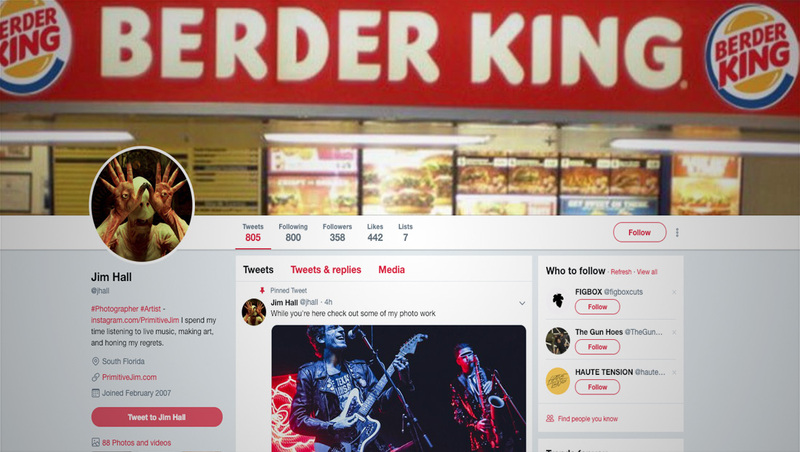 Hall eventually would updated his Twitter profile with a banner image featuring another modified photo showing a counter with a “Berder King” banner above it.